· Tasty food prepared on clients wishes from ecologically clean products grown in the farm. Wedding party, traditional holiday, anniversary celebration, informal meetings with friends or with business partners, seminar or collective recreation with colleagues – any event succeed with us in Kempeni. In more than a century old country farm-house even 120 guest will feel comfortable, but in summertime we've accommodate up to 300 sports games participants. 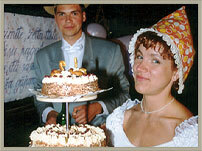 We will try to fulfill any of your wishes that lead to make you and all your friends happy in your special event. If you love peace of a countryside, unspoiled environment and ancient latvian traditional style, Kempeni is the right place for you. In winter or summer our guests can spend a night comfortably in the guest house accommodation built in the ancient manor-house’s servants building. Different rooms are available. 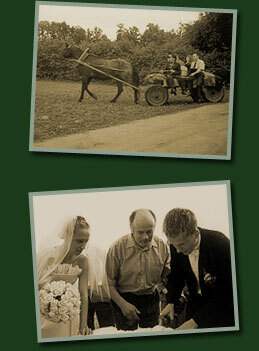 They are all designed in antique Latvian traditional mood. If you are merry group of friends – you can stay in 10 bedded mansard room. There is a special room for just married couples. 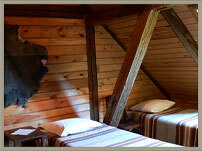 Groups of travellers will sleep well in twin rooms after long journeys. For our youngest guests we have baby cribs. For sports games participants in summertime we can offer campsites as well. What ancient Latvians did in sauna and how? All that you can find out and try yourself with us at country guest house Kempeni. The sauna house was built according to the best national traditions. 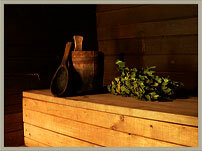 We offer you aromatic home-made sauna-brooms for steam and aroma therapy. After taking a sauna you can cool down in water bath or with a cup of beer on the terrace of the sauna building. Our mistresses will cook tasty meals of ecologically clean products grown in our farm. Here you can taste our special meals – genuine lamb shashlick prepared by owner of Kempeni or trouts grown in our farm's ponds. 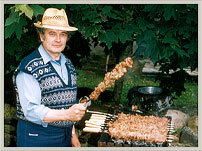 In nice weather you can enjoy countryside deliciousnesses in the garden picnic site with open-air fireplace. 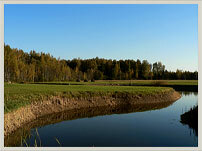 The nature in Kempeni is all around – forests and meadows, birds and wild animals. We invite you to meet them closer. For pacient – wathing from the watch tower, for them who like activities – in summertime or in wintertime to go for a walk along the paths of wild animals with Kempeni owner's guidance. For them who aren't in a hurry – to have a good time at the ponds fishing and swimming. For sweet-teeth – to pick berries and mushrooms in the surrounding forests.